One of the guys that work there has a very unhelpful attitude towards his customers ! He should work on his customer service and deal with every customer query even the small ones ! Easily the best cobblers in West London. Been going for years, excellent value. Just remember to bring cash! Had 5 keys cut here on a Friday - of the five, two didn't work. I had to thus get a new set cut elsewhere for the weekend, but on returning my keys Monday they refused to refund my useless (and very expensive) keys. In short, whilst their cobblers service may be good, I can't recommend their key cutting. We are never refuse refund a money for a key cutting unsells they are cut from not originally keys..we always give us e second chance for re cut them.we always provide 100% good service. Had 2 pairs of low heel boots, the rubber was totally worn down to the wooden heel, and these have been built up perfectly. boots restored! Best cobblers in London, recommended funny enough by another cobbler that was unable to do the job. I live in central London but I'm happy to travel to Chiswick. They are great professionals! I cami in with a difficult problem with my shoes. I had been turned away by at least 5 other cobblers. 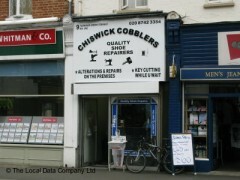 Chiswick Cobblers were fantastic! They not only could raise my motorbike boots, but they delivered more then they promised and all with a smile. I have been to a few cobblers in my time, but this place is the best, with friendly and extremely knowledgeable staff, great price, this is simply the best cobblers in Chiswick you will not be disappointed.